Here is a mini case study on how to organise your physical library of books with the help of Story Turbo (v. 2.2), a virtual corkboard software. (There is also a slightly cheaper version called Story Lite without the image support.) My particular purpose for this exercise was to come up with a project plan for reviewing literature for my dissertation, for which I have only about 9 days available. I have of course analysed my literatures before, but now I need to pull everything together for one last time for writing up my literature review chapter. Just to be clear, here I’m only talking about organising and analysing an actual library of around 200 physical books which have taken up about five shelves in my bookcase. I need to scan them visually for relevant quotes that I may use in my dissertation. The organisational challenge is to identify exactly which books are the important ones and what literatures are exactly represented on my bookshelves. STEP 1: Organise your books on the top of a large desk (or on the floor) into thematic groups (distinct areas of literatures). In my case this has resulted in 7 overall groupings, within which there were up to four sub-groups. I organised these piles of books in “columns” and “rows”, imitating the format of a table or spreadsheet in a software. STEP 2: Open Story Turbo (or Story Lite) on your desktop and represent each pile of books with an index card (I made mine look like yellow post-it notes on a grey background). There was a one-for-one correspondence between a pile of books and an index card, the overall effect being a series of columns and rows of yellow post-it notes on a virtual corkboard in the exact same order as my book piles. I ended up with twenty index cards in Story Turbo, organised into seven columns. STEP 3: Analyse, organise and annotate your library. You may discover new relationships between the groupings (areas and sub-areas of literatures) and may want to re-organise both the virtual index cards and the corresponding physical piles of books to reflect the new order. You can add as much detail as you like to each index card. If a pile of books is too big and too diverse (e.g. 20 books with 5 sub-themes), then you could create additional index cards and break up the pile into five smaller piles. The goal here is to organise your library and also capture electronically both the overall structure of the library and the descriptions of its content. STEP 4: One of the main reasons for using Story Turbo is to be able to export the outcome of this analysis in a number of ways. I have chosen an RTF export, as I wanted to manipulate this list further. STEP 5: I copied the contents of the RTF export from Word and pasted it into Natara Bonsai. It wasn’t the cleanest of exports, in the sense that the order of the list didn’t perfectly reflect the order of index cards in the columns, but it was only one or two items that needed to be repositioned out of 20. Also, the RTF contained some horizontal lines and line breaks which needed to be deleted in Bonsai. However, doing this sort of list editing is a breeze in Bonsai. I reorganised my list into a hierarchical outline where the content was grouped thematically. After a bit more analysis I had realised that the seven larger groups could be consolidated into five groups. STEP 6: In order to come up with my project plan to review these books, I allocated days according to the importance of each theme to the research question and the number of books available in each pile. STEP 7: I added the allocated themes (representing piles of books that are still on my desk) as all-day appointments to my Google Calendar, to serve as a reminder, so I know how much time I have available for reviewing each pile. All I need to do know is start working through the piles of books each day, and slowly start clearing my desk as I put the processed books back on the shelf. 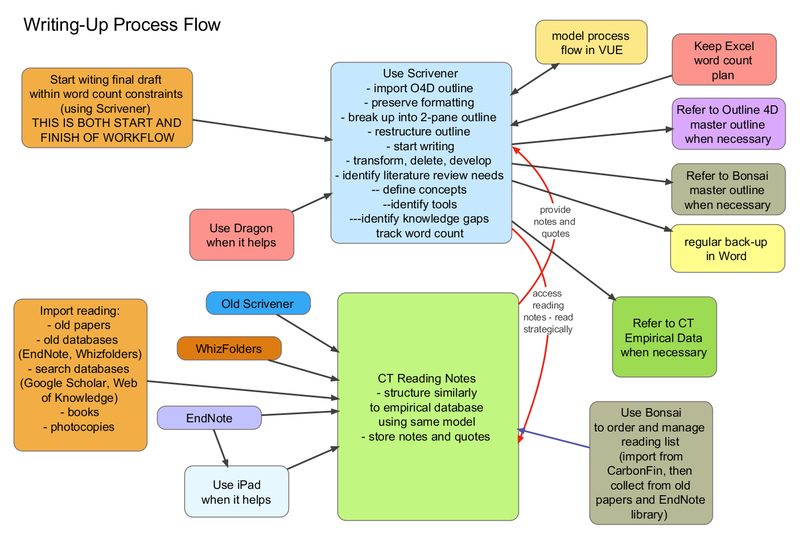 (By “processing” I mean reviewing my handwritten comments and post-it notes in the books and recording the selected quotes and notes in my ConnectedText database – more on which later).